Over 200 civil servants took part in a dress down day to support Rotaract Blue’s Open Arms Programme on Thursday, 28 March 2013. Open Arms promotes non-discrimination for disabled persons and aims to help integrate those living with disabilities into the community while providing support and recognition to persons who care for them. As part of this year’s programme, Rotaract Blue organized dress down months to raise awareness of the different disorders, and asking companies to wear a specific colour associated with the disorder on any chosen day that represent disorders. For the remaining months, and according to international standards: purple is for Attention Deficit Disorder (ADD) in March, grey for Dyslexia in April, and teal for Obsessive Compulsive Disorder in May. 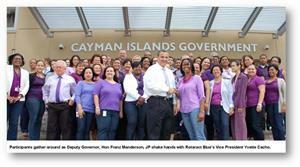 The Cayman Islands Civil Service, which is the second organisation to participate in the programme, donated a total of CI$1135 to support the fight against ADD in March. Ministry of Finance had the largest number of participants with 46 staff taking part. With over one billion people living with disabilities around the world, Rotaract Blue stands committed to this initiative.